‘Click’ thumbnails below to enter gallery mode. • Cabinet linings in durable, white textured melamine. • Vertical fluting with matching crown and skirting mouldings. • Face framing, doors, top and back panels in Dulux ‘Timeless’. • Custom door design with ‘faux’ break to give balance to the design (see detail picture). • Soft-close/Self-close door hinges and drawer runners. • Chrome ‘Bee-hive’ door knobs. • Space to accommodate TV media equipment. • Half drop clothes hanging. This entry was posted in Cabinetry, Uncategorized and tagged alcove cabinetry, bedroom furniture, bespoke cabinetry, built in cabinetry, built-in wardrobe, cabinetry, hand painted, media cabinetry. ← Maker’s mark logos have arrived! Display case in Ripple Sycamore, Ebony & Scorched Oak. Alcove Cabinetry…it’s all about the detail. 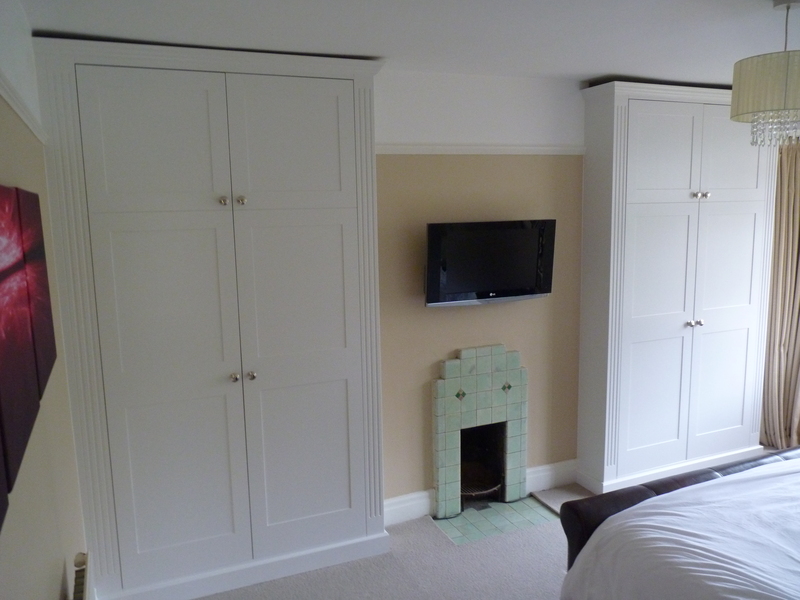 Why Fitted Alcove Cabinetry ? Oak Studio Lift-up Table… NOW in the ONLINE SHOP! LAST ORDERS!… just in time for Christmas! Maker’s mark logos have arrived!